Sunday Share #31 - Currently + some Exciting News! Hi there, how are you? How's your week been? 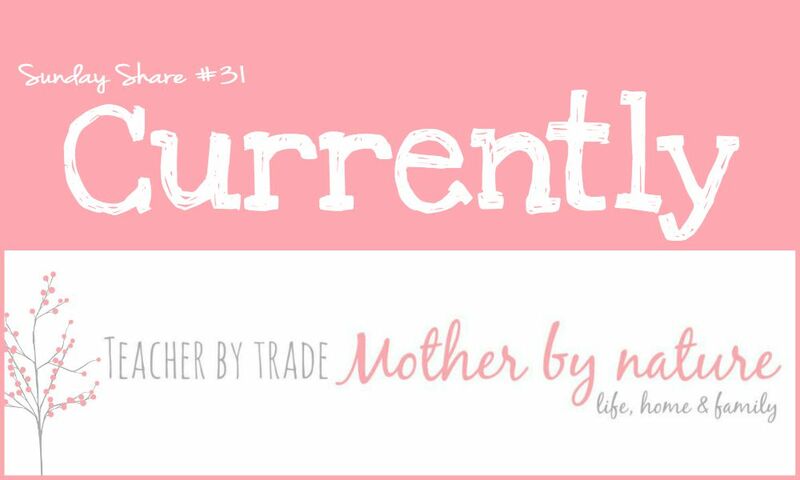 I have some exciting news...no, I'm not pregnant or engaged...it's something 'blog' related - I bought my own domain www.teacherbytrademotherbynature.com. Woohoo! I created this blog almost a year ago*. I wanted a space of my own, a place for me to share tidbits of my life, home & family, and share creative ideas. A place where my readers can be inspired, be creative and be themselves. *My Facebook page was created in May 2014, and the blog was created in September 2014. Last week, I saw GoDaddy was having a Special -"Buy your domain for less than $1.50" - it was something I couldn't pass up. It was an opportunity for me to branch out and make my blog MORE real and professional. So I bought it and my blog is now a .COM, not blogspot.co.nz. It's such a cool feeling to know I own my blog name! It's all mine. To celebrate my new domain, I decided to give my blog a makeover. I have made several changes to my blog over the past 10+ months of blogging, however this time I did a total redesign of Teacher by trade Mother by nature. Oh-so pretty! I absolutely LOVE the look of my blog, and best of all - I re-designed it myself. Well, I downloaded this gorgeous template, and edited the HTML code to suit my new look. I designed & craeted my own blog header (on PicMonkey). I have designed all of them actually but this is, by far, my favourite. 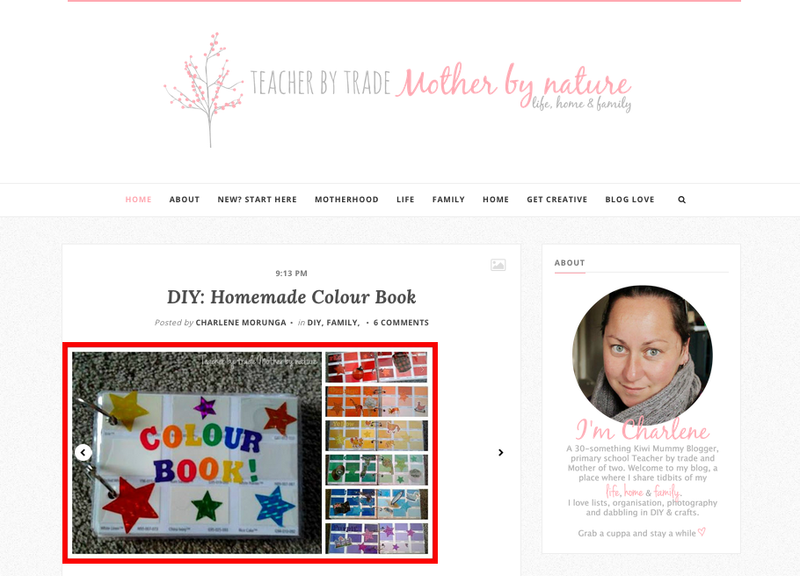 I also created a grab-a-button (found in the sidebar) and chose a girly, chic & professional colour scheme. Please feel free to have a look around - there is some pretty cool stuff happening on this blog. It is a work-in-progress and I am going back through all my posts and updating them. I am really proud of my little space in the blog-o-sphere. Other than buying my own domain and re-designing my blog (pretty exciting stuff if you are a blogger), here is what I am currently watching, making, feeling, planning, organising and loving. Watching: my little boy sleeping in his cot, in his OWN room! My son has been sleeping in a port-a-cot for the past 6 months. From open homes, to moving, and staying with friends, Master M is finally back in his cot (which was originally Miss B's 10 years ago) and he is sleeping in his own room. (tear). I had it in my head that he would be in with us until, at least, Christmas, however it didn't work out like that - the first day/night sleep in our new home, was in HIS room. He is actually sleeping better on his own, so it's been a blessing. I still miss him though, even though is just behind the wall. Making: DIY: Homemade Colour Book - I made this book when Master M was 5 months old, a year later and he still loves reading it. Planning: to unpack the last of the boxes that are inside. You wouldn't think we have only been here a week, I have pretty much unpacked the whole house. Although, I still have the office to unpack (it's detached from the house) - it is going to be a BIG job! I am quietly excited about setting up my office. eek! Organising: my Pantry, Wardrobe & Linen Cupboard this week. Amazing! I shared the below photos on my Facebook page. And it has motivated me to start a new series 'Organising My Home' - Sharing how I, well, you guessed it, organise my home and also sharing some 'quick tips' of how you can too. Watch this space! Loving: my home, my family and my blog (oh I really do - it is my happy place). How are you FEELING? What are you LOVING? Share what you are currently up to in the comments. Have a great week. Thank you Lydia :) I love it too!